TORONTO– The Cavaliers suffered their worst loss of the season on Monday, a 127-99 routing by the Minnesota Timberwolves. Monday’s installment was just the latest in a series of setbacks for the Cavs, who are in the middle of their roughest stretch of the season. Going back to their Christmas Day game against the Warriors, the Cavs are 2-5. They also have two more games on the road before they return home, and have played just one game at Quicken Loans Arena during that stretch (a 127-110 win over Portland on Jan. 2). According to numerous reports, the team started off their Wednesday practice with a film session in which Tyronn Lue showed the entire first quarter of Monday night’s game. Lue’s message was clear, according to Isaiah Thomas. The ironic thing is the Cavs faced a similar lull like this last season, right before they took on the Toronto Raptors, their opponent on Thursday night. 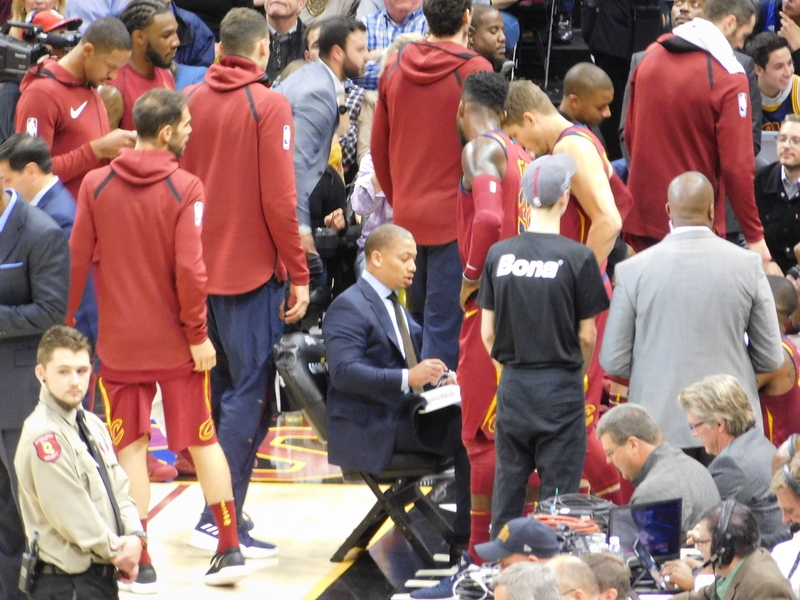 Then, Lue also conducted an intense film session as the team was on a three-game skid and getting beat up defensively. The message then was the same as it is now. More than anything, the Cavs need to pick up their effort on the defensive end of the floor, especially in one-on-one situations. It’s an area they picked up during their 13-game win streak, but have since fallen back to the league’s basement with the 29th ranked defense in the NBA (only the Sacramento Kings are worse). But while midseason lulls have been characteristic of the Cavs over recent years, Lue says with so many new faces on a team trying to make its fourth straight Finals appearance, that isn’t an excuse. Lue said despite the defensive issues, he is not considering any lineup changes. While these lulls have been characteristic for the oldest team in the league, their struggles have come as both Tristan Thompson and Isaiah Thomas have been getting reintegrated into the lineup. As Iman Shumpert and Derrick Rose get closer to their return, there will only be more kinks to be worked out. Thomas, for what it’s worth, has said he doesn’t think that he or the team is getting lulled into a sense of complacency considering their history of making it to the Finals despite any regular season rough patches.